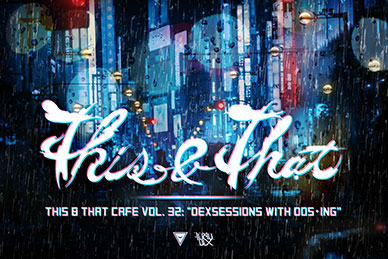 For This&That Café Vol. 32, TokyoDex is teaming up with our friends at artist collective Dos•ing (Dreaming of Sleeping). Look forward to the usual eclectic array of artistry you have come to expect from #TnTCafe, with a little extra edge and an underground nightlife feel. Drop by for ethereal evening that promises to delight all the senses. dos・ing, short for Dreaming of Sleeping is a Tokyo-based collective of artists and musicians dealing with sleep deprivation and insomnia brought on by the infinite drone of neo-Tokyo. These artists strive to give life to the Tokyo underground nightlife culture by promoting cutting edge music and throwing the most lit events around. Tokyo based future dream pop band LLLL have created and dreamt up a unique artistic modernity to their sound. Their gritty atmospheric sounds conjure dreams of flying through the sky, in a future filled by a symbiosis between humans and computers, that as opposed to being post apocalyptic is actually comfortably beautiful, bright and optimistic. Glow and the forest are a soft gaze indie rock band that has been playing in Tokyo and around Japan for the last 12 years. They are comprised of an American on guitar and two Brits on drums and bass. Their sound is characterized by odd song structures, guitar arpeggios, and floating melodies. They released their first album (Self Titled L.P.) in 2009 and their second album(Pheromone Chemicals) in 2012. They are currently halfway through production on their third record and have changed their sound over the years to incorporate three part vocals. Alex Wasik of Municipality seeks to provide the listener with a breath of fresh air from the conventional music experience, moving through an array of styles to induce mood swings from exciting to melancholy, dark to uplifting. In collaboration with others from varying music scenes, Municipality and all members of it’s projects aim only to make you feel something. Born in Japan (1991) Shiro (Taku Kaneko) is a young, self-taught artist. Raised in the country side, Shiro’s art is highly influenced by the harmonious patterns (and expansion) of the universe. Each brush stoke is a resemblance of how the branches and roots of plants and trees seek the path of least resistance in search of nourishment and growth. His goal is to inspire humanity within the audience with an expression/impression of an uninhibited and free-thinking spirit. Presently, Taku works as a free-lance Graphics Designer/Artist. In his spare time he works with local event organisers and DJ’s as a live painter. Events and venues include: Re-birth, Ozora/One Day in Tokyo, AGEHA, Shinjuku Christon Cafe, Shinjuku DekaBar-Z, Shibuya Womb, Ruby Room, Club Edition, etc,. A straw-sandal wearing bipedal amalgam of rap and Art, STONE63 released his first album “ACQUISITION” on November 23rd, 2011. Since then, he has also exercised his unique artistic style in live painting, murals and CD cover artwork. Using open cans and straws as unlikely tools, his live painting is truly one of a kind. He also shares his distinctive vision through popular live-painting workshops where he paints directly on items brought in by participants. A two-time champion in individual rounds at “Live Paint DOJO 2013” and “Live Paint DOJO 2014 in Kyoto,” he continues to broaden his repertoire with performances at live events and showing artworks large and small at various venues. Born in Milan and brought up in Johannesburg, creator Shizuka Nagahama brings her distinctive pop style to film, illustration, music and myriad other media. For This&That Cafe, she has assembled several creators to collaborate on a video that will hopefully inspire laughter. VJ Unit active in the city, made up of two guys from the Tokyo advertising world. Honami was born in Nigata in 1989 and raised in a place close to nature on the Sea of Japan coast. She started dancing at a young age and practiced rhythmic gymnastics in junior high and high school. Later she studied dance at Japan Women’s College of Physical Education and began a career in dance and entertainment upon graduation. In 2015, she flew to France and stayed there for over one year studying and performing in alternative spaces such as churches, galleries, on bridges, and in streets and plazas. She continues to search for new expressions in dance that stem from her ordinary life routine. After coming back to Japan, she has produced her own shows and sometimes works as a model for fashion events. Come draw and glow with us!